SO YOU WANT TO LIVE MINIMALIST? SMALL FOOTPRINT, BIG BENEFITS The ACAD student-built microhouse takes up minimal space but has sizeable environmental impact by using solar panels and other eco-friendly design elements. A 160-square foot student-built microhouse offers tiny living lifestyle with a small environmental footprint – for less than traditional homes. Twenty months after the Academy of Construction & Design kicked off the big build of its tiny house, the on-trend microhouse has hit the real estate market with a list price of $55,000. “We think the purchaser might be someone who wants to purchase the house for their first home – it’s affordable,” said Beth Moore, program director for the D.C. Students Construction Trades Foundation. “Or, maybe as a guest house or getaway cottage to use themselves or rent out peer-to-peer for short term stays.” A backyard office or a business home base is another option, she added. The D.C. Students Construction Trades Foundation is now fielding inquiries about the purchase of the house, now parked on a back lot at IDEA Public Charter School in Northeast, the school the Academy calls home. The Foundation sponsors the Academy alongside IDEA. Under the guidance of professional builders and certified experts in carpentry, plumbing, electrical and other skilled trades, junior and senior ACAD students built a house constructed of wood and Hardie Plank siding, with vinyl windows. Innovative design elements include a rainwater collection system and solar panels to help the homebuyer live “off the grid,” said Moore. Step inside, and there is eco-friendly bamboo flooring. Plus, amenities like stainless steel kitchen countertop and recessed lighting. 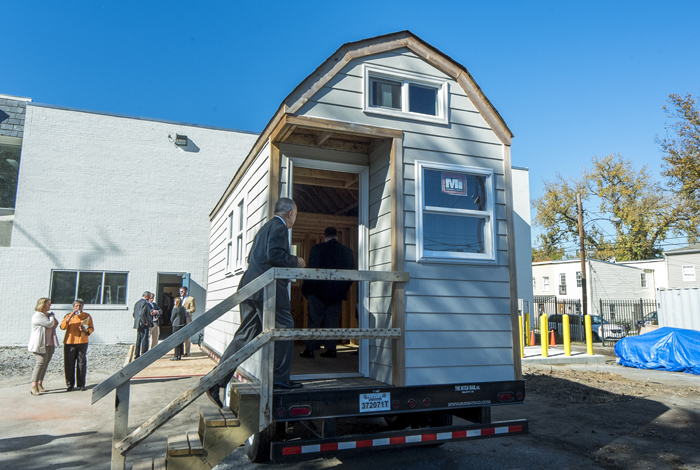 The 160-square-foot portable structure also has two lofts – space-saving areas that can be used for living or storage, Academy Director Shelly Karriem told JOBS Coalition Pathways last year. While students gained invaluable experience using construction tools and building materials, learning worksite safety, and reading blueprints, they also learned the importance of cooperation and seeing their hard work translate into something tangible. “Applying these skills in school, work and life can help them be successful in whatever they choose to pursue in the future,” noted Moore. Proceeds of the sale will be reinvested back into the Academy’s education and training programs for high school students, the Foundation stated in a Nov. 3 news release. So what’s the next project on the table for Academy students? They plan to start building a second microhouse this academic year that incorporates new building designs and materials, like the more energy-efficient structural insulated panels (SIPs), according to Moore, with an expected completion date of June 2017. Also on the radar for next year: the groundbreaking for a single-family home in the Marshall Heights neighborhood in Southeast, Washington, D.C.